Another case of celebrity physics? Maybe so. Standards flying high, no doubt. They looked everywhere around the world to find a counterpoint to the severe cold gripping the UK, and lo and behold, they found…Chicago! No mention of Vancouver, of course. Or of the fact that they are making the strongest case for totally decoupling weather from climate, thereby making climate change as pointless as ever. If these are the standards followed everywhere else at the BBC, there’s lot of “news” that ought to be reconsidered as petty propaganda pieces. UEA News: Help Rebrand The University Of East Anglian Silly Walks! London and Norwich, 26 Nov 2010 (MNN) – In an effort to reposition itself after the Climategate debacle, the University of East Anglian Silly Walks (aka UEA) is launching today an international competition aimed at exposing its true nature in a new spirit of transparency. However, due to budgetary concerns and in order to lower CO2 emissions, the acronym will have to remain the same. This means the additional challenge for all budding brand experts is to come up with a more meaningful long-form for “UEA”. ps Sadly, all FOI requests to UEA for details about the above will never be fulfilled, as there was a North Korean student once at the University and any openness would be contrary to Juche. Very shortly: know your science, know its limits, know its biases, involve as many people as possible, pick a policy that looks best across many scenarios and can be easily changed. Now, it is pretty easy to argue that the IPCC has failed on all fronts: by fixating on worst-case analysis thereby restricting the range of scenarios; by not assuming that the world may not behave as expected, steering quite clear of providing any sign of being humble about anything; by refusing to consider the bias of its own authors and editors, through its flawed review system; and by consistently trying to keep the public at bay, with countless elitist “summits” only good for people on expenses and/or without a day job. 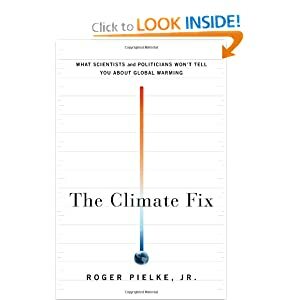 It will be interesting to compare the above with whatever Roger Pielke Jr has written in “The Climate Fix” (also with “Look Inside”), a book I bought a few days ago. […] on the important matter of what decision-makers can do to handle complexity […] Mitchell’s book is at its best. Nearly all the systems we care about – the global climate, the human body, the international financial system – exhibit the various forms of complexity she dissects. […] A typical reaction, displayed in many policy documents, is that when dealing with scientific uncertainty in relation to important systems, policy-makers should adopt a precautionary approach. […] Both unintentional vandalism and irresponsible dithering can lead to disaster. Those who oppose precautionary thinking often argue that it becomes incoherent or dangerous when spelled out in detail. The problem is that precautionary thinking is supposed to help in situations of uncertainty; that is, in situations where we lack knowledge, or where our knowledge is imprecise. But since decisions under such conditions tend to have the potential for grave outcomes whichever option we choose, we need guidance on how to err on the side of caution. High-profile opponents of the precautionary principle, such as Barack Obama’s new regulation tsar, Cass Sunstein, have argued [for] a form of cost-benefit analysis as the best way to ensure that the potential costs and benefits of all courses of regulatory action – including inaction – are placed ‘on screen’. Mitchell’s critique of cost-benefit analysis is a familiar one. It is suitable for well-understood systems, unfolding over short time periods, where we can assign probabilities with confidence. But the probability of a given outcome – financial profit, the extinction of species, an increase in sea levels, high blood pressure – in whatever system we are analysing will often vary significantly with small changes in the starting conditions, with our assumptions about the causal interactions within the system, and with variation in background conditions as the system evolves over long periods of time. Our estimates of these conditions will often be imprecise, or thoroughly conjectural, in spite of the apparent precision of the cost-benefit methodology. The question is how to turn uncertainty of this sort into trustworthy policy recommendations. Mitchell’s stance on these matters is not new […] but her way of justifying it is particularly crisp and compelling. Simple cost-benefit analysis will tend to collapse a rich understanding of the complexity of a system into a single set of all-things-considered probability estimates for its likely end-states. 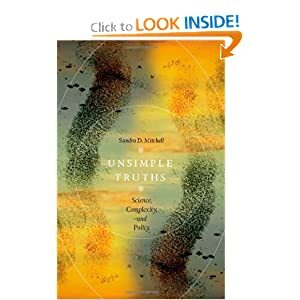 In so doing, Mitchell says, we mask our grasp of complexity, and replace it with a bland expression of uncertainty. […] once we do acknowledge complexity, two strategies become available. First, we can examine how our proposed interventions will fare under a range of different plausible scenarios for the unfolding of a complex system, picking the strategy which has a satisfactory outcome across the largest range of future scenarios. Second, we can assume that the world may not behave in a manner we expect it to, and therefore make sure that the strategy we choose can be undone or altered with reasonable ease. The end result should be a set of concrete recommendations that are thoroughly in accordance with precautionary thinking in remaining humble about our state of knowledge, while taking into account the full range of scientific evidence. […] The question of how good a particular outcome would be, were it to arise, should be wholly independent of the question of how likely that outcome is. And yet it turns out that we tend to overestimate the likelihood of outcomes we favour, while underestimating the likelihood of outcomes we don’t want. This is known as ‘optimism bias’. And ‘affiliation bias’ results in (for example) the conclusions of studies on the effects of passive smoking varying according to the authors’ affiliation with the tobacco industry. Needless to say, these psychological results suggest that policy-makers need to be attentive to the institutional sources of the data they use. And this, in turn, underlines a long-standing theme of work among social scientists, who have claimed that broad public participation in risk planning may increase the quality of risk analysis. Mitchell’s stance on policy isn’t complete, but perhaps that is to be expected in a complex world. In the 70s, I worked with someone who had worked in Guyana and had married a woman from there. In a coincidence with SMc, he worked for a mineral survey business. He was in charge of their electronic equipment. One day he had to go to a remote work site to repair some equipment. He and another employee flew in on a jet helicopter. The helicopter could not land at the camp but deposited them on a sandbar in the middle of the jungle river. A launch from the camp was to come out to fetch them. They helicopter landed and they unloaded their equipment. The helicopter took off and they watched it disappear into the distance. They then stood there with their equipment as if they were waiting for a bus on a sandbar in a jungle river. They both then realized that they were not waiting for a bus. They were waiting on a sandbar in a jungle river with caiman (a form of crocodile) swimming around them. My friend’s colleague then noted that they didn’t even have a pointy stick to defend themselves. The nub of this anecdote is that they came to that river sandbar on top of a pinnacle of technology, They were the rulers of the world with a world wide technological economy supporting them. They had no thought that they were vulnerable in any way. The AGW issue is of the same sort. It is easy to think us to be not vulnerable when we are surrounded by the power of our technology. Yet as my friend discovered we are only as invulnerable as our technology allows and when that fails we are very vulnerable indeed. The hockey stick scientists have produced nothing that is of assistance to policy makers. Their results have been debunked and there is little prospect that their will be any change in this. This is not good news. It does not mean that AGW is not an issue. it means that we have been denied what had been hoped to be a useful guide for policy makes so that we as a human society could chose a path to cope with possible dangers. We might be standing on a sandbar in a jungle river with caiman swimming around us without even a pointy stick to defend ourselves. Since the science has failed, we just do not know. or…”Wonders of the English language”. Funny people, the climate scientists. One would expect, for example, that behind a website sporting a “new rapid response team of climate scientists [that] promises to connect reporters and editors with a team of experts” (in the words of The Guardian), there would be at least the one climate scientist ready to put their face where their internet connection is. Alas, one would be wrong. For who’s organizing the Climate Rapid Response? As far as I can tell, the combined scientific output of the public faces of the Climate Rapid Response Team is zero. Or maybe one, by stretching things a bit. This is not to criticize anybody, esp. Prof. Mandia, who after a couple of decades of teaching introductory climatology may know a thing or two, so to speak. But in absence of original research by its leaders, we can only expect the Climate Rapid Response Team to be a campaigning (political) platform, not a scientific one. Were AGW Scientists Completely Sidestepped In Copenhagen? Will CO2 Cause Bieber Fever In Fish Worldwide?